Vancouver, British Columbia--(Newsfile Corp. - November 8, 2018) - Vendetta Mining Corp. (TSXV: VTT) ("Vendetta" or the "Company") is pleased to announce the last batch of drill results from the 2018 Resource Development program on the Pegmont Lead-Zinc project in Queensland. Significant results from the last batches of samples from Vendetta's 2018 drilling program are summarised in Table 1, locations of the holes are shown on the map in Figure 1. Michael Williams, Vendetta's President and CEO commented: "The discovery of the new fold structure in the shadow of the planned open pit highlights the upside potential that remains at Pegmont. The corporate strategy to date has been to focus efforts on the development of mineral resources to support a 10-year mining inventory, we anticipate the PEA will demonstrate the economic potential of that. 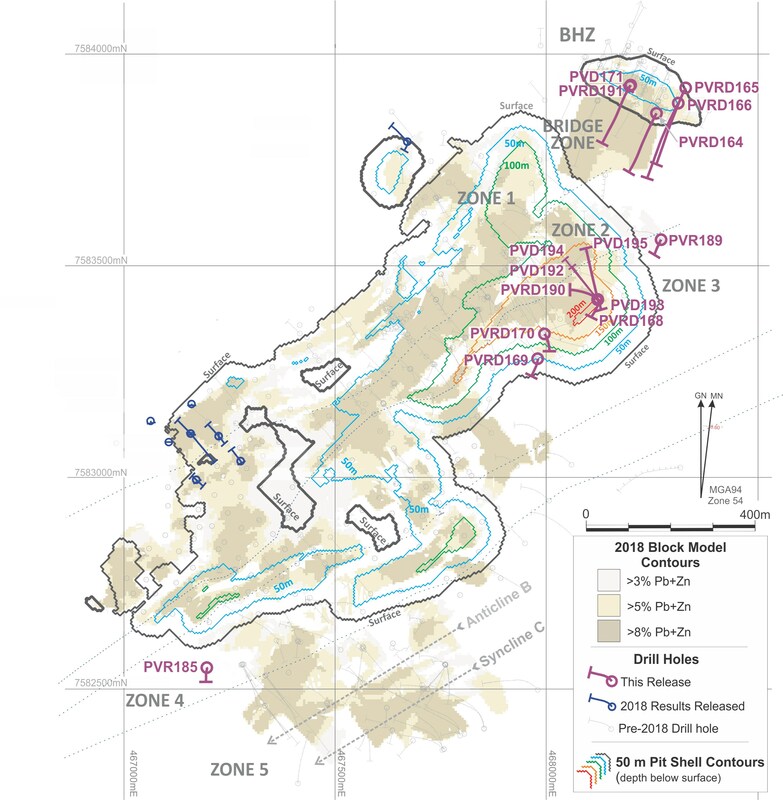 We will now start to broaden our approach to Pegmont, looking to identify and testing brown field exploration targets, the recently completed mapping exercise is the first step towards that." Several holes were drilled to better scope the geometry of a structure discovered in late 2017 following an intersection in geotechnical hole PVRD154. It is interpreted that PVD154 drilled through the upper fold of a recumbent fold intersecting 15.92 m at 12.12 % Pb+Zn (9.07% Pb, 3.04% Zn). Holes PVRD168 and PVD193 were drilled approximately 60 m along strike to the north east of PVRD154. PVRD168 deviated excessively in the RC pre-collar, the hole was abandoned. The target was later re-drilled with PVD193, cored from surface to aid targeting, intersecting the upper fold at a low angle and the steep limb. Holes PVRD169 and PVD170 were drilled 160 and 100 m respectively along strike the south west of PVRD154. PVRD169 deviated excessively in the RC pre-collar and the hole was abandoned. Due to the deviation in PVRD169, the next hole PVRD170 was drilled in core from surface and intersected the upper, flat laying limb of the new fold structure. Having successfully scoped the geometry of this new fold a program of 15 holes for 4,400 m has been designed to bring this new structure into a resource, this drilling is planned as part of the next program. The fold that separates Zones 2 and 3, is a recumbent fold, called the "Z" fold. In the latter part of 2017 hole PVRD156 intersected 5.80 m of 10.31% Pb+Zn (7.36% Pb, 3.03%Zn) in the upper flat dipping limb and 36.61 m of 12.99% Pb+Zn (9.48% Pb, 3.51% Zn) passing through the steeply dipping limb at an acute angle and through the lower fold. These intersections were the most northerly intersection in the Z fold. A series of four holes were drilled to better define the geometry of the Z Fold on this section. On one section PVD192 intersected the lower flat limb, PVD193 first intersected 15 m of the top fold sub-parallel to layering in the low-grade halo before intersecting the steeply dipping limb also sub-parallel to layering and PVD194 successfully intersected the top flat limb of the Z Fold. PVRD190 deviated excessively and intersected an area modelled as being attenuated (stretched and low grade). Structural work on PVD195 is not complete however the hole may have intersected the steep limb of the Z fold. Two holes PVRD165 and 166 were drilled on the southern end of BHZ to test for the extension to the Bridge Zone outside of the mineral resource, both holes intersected BHZ mineralisation as planned but didn't intersect the host lithology at depth, the amphibolite dyke was intersected some 30 m lower than projected, this suggests that a fold may have dropped the Bridge Zone host beds down and that the holes should be deepened too investigate below the amphibolite dyke. PVRD164 drilled up dip of the Bridge Zone, the hole intersected 3.3 m of barren host banded ironstone, with classic garnet selvages on both hangingwall and footwall. The intersection is about half the average thickness for the Bridge Zone and implies that the up-dip connection back to Zone 2 is an attenuated area. PVD171 was a shallow cored hole, drilled to confirm transition material types at BHZ, in an area previously drilled with RC. Two vertical RC holes were drilled to test for host bed extensions at the northern and southern end of the pit main. PVR189, drilled in the north east of the main pit was investigating the presence of the host lithology between along strike from Zone 3 towards a projected position of Bridge Zone. The hole intersected two mineralised host units: 1 m at 2.17% Pb+Zn and 1 m at 3.64% Pb+Zn. This is an encouraging intersection and is not dissimilar to the results seen elsewhere in the attenuated host units between Zone 2 and the Bridge Zone. PVR185, drilled to the south of the main pit in Zone 4 is now understood not to have drilled deep enough to intersect the host unit, deepening this hole will be considered in future programs. Both of these holes were subsequently developed for ground water monitoring with the installation of gravel packed slotted PVC casing. * True thickness is estimated using structural measurements and three-dimensional geological modelling. # Drill intersections are summarized intersection lengths >2.0 m, using a combined 1% lead and zinc grade with maximum 1 m internal dilution. Intervals indicated as "included" are at a combined 3% lead and zinc grade with no internal dilution. The Company would like to advise that it has made the final cash option payment totalling AU$1,000,000 to the vendor on the November 6, 2018, in accordance with the terms of the Option Agreement. The Company has been granted an extension to the Pre-Paid Royalty Agreement, the updated agreement terms are described below. The Option is not exercised until the Pre-Paid Royalty and any additional payments, as defined below are made. In the event the Pre-Paid Royalty is paid between November 1 and November 30, 2018 the Company will make an additional payment of AU$50,000 and the Companies credit against the future royalties will be reduced from AU$5,250,000 to $5,000,0000. In the event the Pre-Paid Royalty is not paid by November 30, 2018 the Company will make a payment of AU$100,000 on December 31, 2018 and in doing so the Vendor has been granted an extension to March 31, 2019. In the event the Pre-Paid Royalty is not paid by March 31, 2019, the Company will pay an additional AU$300,000 on April 1, 2019 and in doing do so the Vendor has granted an extension to May 6, 2019. In the event the Pre-Paid Royalty is not paid by May 6, 2019, the Company will pay an additional AU$350,000 and the Companies credit against the future royalty will be reduced from AU$5,000,000 to $4,500,0000 and in doing do so the Vendor has granted an extension to November 6, 2019. Applications for indicative approval for the transfer of the Project to Vendetta from the Queensland Minister for Natural Resources, Mines and Energy are being prepared for lodging on Monday November 12, 2018. Field work at Pegmont is now complete for 2018. A detailed mapping program has been completed and is currently being compiled. The company expects several exploration targets to be generated from this work. The latest guidance provided to the Company from the independent consultants is that the PEA will be complete in November. The drilling involved holes either cored from surface PQ and HQ core sizes or with pre-collars drilled with reverse circulation ("RC") 5.75" diameter face sampling bit to depth prior to casing and continuing the hole in HQ2 diamond core. Diamond core samples were taken on nominal 1 m lengths but varied to match geological contacts. Samples of the core are obtained using a diamond saw to half cut the core, retaining a half for a permanent core record. Field duplicate samples were taken and blanks and commercially prepared certified reference materials (standards) were added into the sample sequence for every hole submitted. These were analysed by the Company and no issues were noted with analytical accuracy or precision. Samples used for the results described herein were prepared and analyzed at ALS Laboratory Group in Townsville, Queensland. Analysis was undertaken using a four-acid digest and ICP (ALS method: ME-ICP61 for 7 elements) with over limit (>10,000 ppm lead and zinc and >100 ppm silver) high grade samples being read with an atomic absorption spectrometer (AAS), (ALS methods: Pb-OG62, Zn-OG62 and Ag-OG62). Drill hole collars are initially located using handheld GPS, and the collars have since been surveyed by a licensed surveyor. Down hole surveys were undertaken using a true north seeking gyroscope with stations nominally every 6 m.
All diamond core is orientated using digital core orientation systems, this data is incorporated into the 3D interpretations. Assay intervals shown in Table 1 are down hole intervals, and the true thickness noted are based on 3D interpretations of the host lithology, structure, and mineralization. Pegmont is situated in the Mount Isa - McArthur Mineral Province, which hosts one of the world's richest endowments of lead-zinc-silver mineralization, including several world-class lead-zinc-silver mines. The forward-looking statements are based on a number of assumptions which, while considered reasonable by Vendetta Mining Corp., are, by their nature, subject to inherent risks and uncertainties and are not guarantees of future performance. Factors that could cause actual results to differ materially from those in forward-looking statements include: the interpretation of previous and current drill, further results from the 2018 drilling program, the accuracy of exploration results, the accuracy of Mineral Resource Estimates, the anticipated results of future exploration, the forgoing ability to finance further exploration, delays in the completion of exploration, delays in the completion of the updated Mineral Resource Estimate, the future prices of lead, zinc, and other metals, and general economic, market and/or business conditions. There can be no assurances that such statements and assumptions will prove accurate and, therefore, readers of this news release are advised to rely on their own evaluation of the information contained within. In addition to the assumptions herein, these assumptions include the assumptions described in Vendetta Mining Corp.'s Management's Discussion and Analysis for the three months ended August 31, 2018.